In Michigan's Upper Peninsula, it snows a lot - several hundred inches a year. Snow can stop traffic, even on train tracks. And back when they mined copper, they had no time for that nonsense. 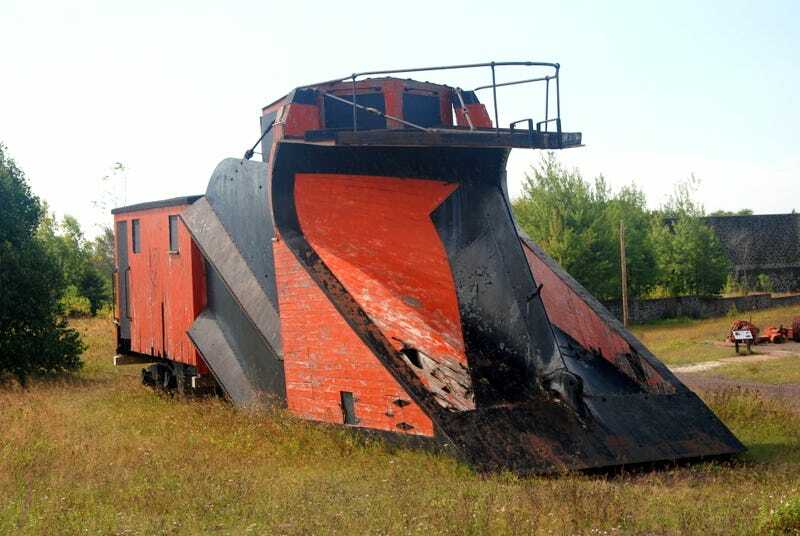 So one mining company got a Russell snow plow - this monster you see here - and just blasted the snow off the tracks. This fine example survives in Calumet where it is parked not far from the Coppertown USA museum. From what I gleaned off of the internet, Russell began building this design sometime after World War I. What you see here does not include an engine. This thing would be pushed by something else. Apparently, that is where the excitement came in. These things were often run at 50 MPH and a spotter rode the plow while an engineer controlled the speed from behind. Trying to spot things at 50 MPH with the snow flying can lead to some zany hijinks. When the mines shut down, the Russell was parked. As with many things in Michigan's Upper Peninsula, you can walk up and inspect this anytime. Some local knuckleheads have sprayed graffiti on it but otherwise it is doing pretty well. The logo on the side is of the Calumet & Hecla mine. Back in the day it was the biggest player in the area. Think of it as the General Motors of its industry - but GM of 1950. It employed the bulk of the people in town and the man who ran the company had far more clout than any local politician. And he probably woke up one day to a monstrous snowstorm and just decreed that work would not stop. No one messed with C&H. Not even mother nature. The mines have all shut down - Calumet and Hecla closed in 1968. Some of it is gone but much remains. Old buildings, mine shafts, and things like this snow plow. It's one of the reasons I love visiting the area as often as I can.